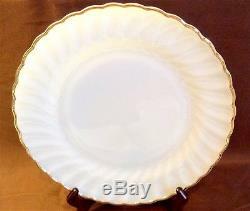 Milk Glass Swirl Golden Anniversary 22K Gold Trim Anchor Hocking 20 Pcs. 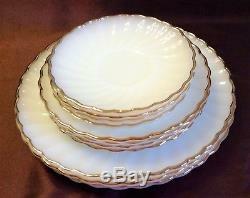 Opulent Golden Anniversary Swirl Pattern: s nowy white translucent milk glass dishes with graceful swirls and lavish 22K gold trim. This pattern was manufactured between 1940 and 1960 then it was discontinued. Depression Glass/Pattern Glass/Pressed Glass - Like all pressed glass, the pieces in this set were made in molds during which time their shapes, swirled rims and maker's mark were pressed into the milk glass. 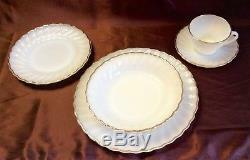 Maker's Mark pressed into the back side of each piece: Anchor Hocking Fire King Dinner Ware Made in USA. 4 dinner plates 10 inches in diameter. 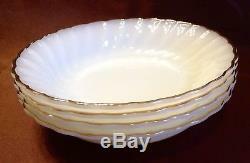 4 soup bowls 7-1/2 inches in diameter and 1-1/2 inches tall. 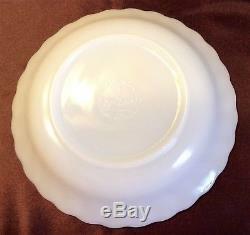 4 salad plates 7 inches in diameter. 4 coffee/teacups 3-1/2 inches in diameter at the rim and 2-1/4 inches tall. 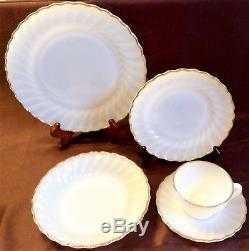 4 saucers 5-3/4 inches in diameter. The set--all 20 pieces--weighs almost 14 pounds. Excellent Condition: There are no chips, cracks, crazing, or repairs. The 22K gold trim is in excellent condition. THERE ARE NO MARKS MADE BY UTENSILS (KNIVES AND FORKS) BECAUSE THE DISHES WERE NEVER USED. There are some minor straw marks made by the mold manufacturing process. After she got it home, however, she decided it was too pretty to use. So the set was displayed in one of her china cabinets for decades instead. It was not unusual for her to make decisions like this where dishes were concerned. When it happened, my Dad just shrugged his shoulders and got out the paper plates. In its pristine condition, translucent snowy whiteness, graceful swirls and lavish 22K gold trim, the set would make a lovely wedding, anniversary and graduation gift. More photos available upon request. 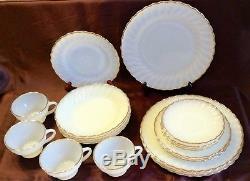 The item "Milk Glass Swirl Golden Anniversary 22K Gold Trim Anchor Hocking 20 Pcs. 1940" is in sale since Thursday, February 15, 2018. 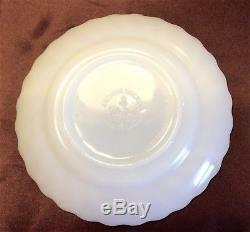 This item is in the category "Pottery & Glass\Glass\Glassware\40s, 50s, 60s\Anchor Hocking\Fire-King". The seller is "antiqueworld1" and is located in DeKalb, Illinois. This item can be shipped to United States.